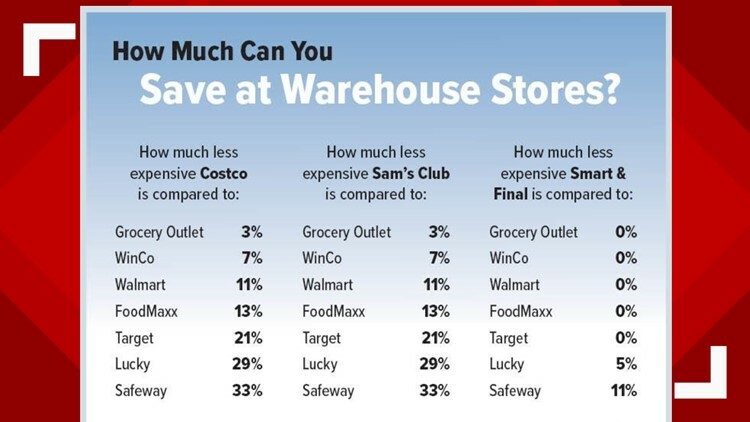 Is Sam’s Club, Costco actually a good deal for the cost of membership? When it comes to the prices on the items they offer, these warehouse stores can be tough to beat. SACRAMENTO, Calif. — Big warehouse stores like Sam’s Club and Costco offer great bulk prices, but those prices come at the cost of an annual membership fee. So, is it actually worth the cost or can you get competitive deals somewhere else? “I can tell you that overall, in general, if Costco and Sam’s Club… sell something, it’s usually the best price you’re going to find for that item,” said Kevin Braxel, Executive Editor of Consumer Checkbook, an organization that has compared prices of goods at membership warehouse stores and other retailers. Consumer Checkbook looked for items of any size but of the same brand and measured prices against other stores in San Francisco Bay. However, while the general answer is yes, there are still other elements to consider. “While these companies may have the best prices for the items they sell, it doesn’t mean that you can’t get a better or a better-priced item from someone else,” Brasler said. Shopping online can reveal items at a comparable price, and, while some retailers like Walmart, even though they might have a higher price, won't be too far removed from the warehouse store price. You might even find a better price on a better-quality item that Costco doesn’t sell. One of Brasler’s sticking points was that Costco and Sam’s Club prices only reflect low prices on the items they carry, which for TVs, tablets, appliances and other items only amounts to a few varieties. “You really do, I think, still have to shop around,” Brasler added. “Now, if you don’t have time to shop around and you want to make sure that the item you’re buying is offered at a low price, I think you can be really confident shopping at these stores." "People are shopping at these places because they expect to save money, and the good news is that you are saving money," Brasler said. "You might spend a lot per visit... but you're still, in terms of saving money, you're still doing the right thing for your finances by shopping at one of these places." "I don't have actually have that much negative to say about these companies. I do think that... for what they have, they consistently offer low prices on about everything they sell," said Brasler.